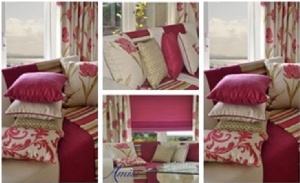 SEAMOOR FABRICS: At H&S fabrics we have a wide selection of high quality fabrics offering hundreds of colour options and top quality printed designs. We have collections in plain, woven and printed fabrics within our range of Velvet, Satin, Moire, Slub Cotton, Jacquard Weaves, Linens, Faux Suede and Dupion fabrics. Our print ranges cover the spectrum from traditional floral designs to brightly coloured modern designs. Our aim is supply our customers with premier customer service which is reflected throughout the company with our experienced and knowledgeable sales team and our friendly, helpful office staff.